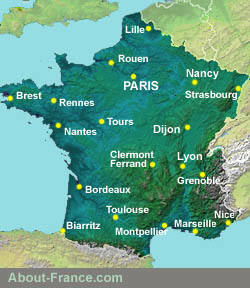 The About-France.com the reliable guide to France - French life, institutions, society, travel and tourism. La dame s'appelle Mme. Dupont > Elle s'appelle Mme Dupont. 2.1.1. Position of the direct object pronoun. When the direct object of a clause is a pronoun, it precedes the verb (including the auxiliary/ies), but does not precede modal auxiliaries. (When the direct object is a noun, it follows the verb). That car is following us. - Cette voiture nous suit. I've put them back in the kitchen. I wanted to see them before they left. - Je l'ai vu hier. Il m'a donné des chocolats. 2.2.1. Position of the indirect object pronoun. When the indirect object of a clause is a pronoun, it precedes the verb (including the auxiliary/ies), but does not precede modal auxiliaries. - Vous me devez cent euros. - Il lui donne toujours un billet gratuit pour ses concerts. He always gives her/him a free ticket to his concerts. Je lui ai demandé d'être là pour 17h30. . I've asked him/her to be there for 5.30 pm. Je peux leur montrer le chemin. 2.2.2. Complication ! Word order with double object pronouns. Clauses with both a direct and an indirect object pronoun. Normally the indirect pronoun object comes before the direct pronoun object; but when the indirect object is in the third person (i.e. is lui or leur) it comes after the direct object pronoun. But she already told us that !. I explained it to you very carefully. I explained it to them very carefully. I can show it to her tomorrow . 2.3.1. Unlike English, where the gender of the third person singular possessive pronoun is determined by the gender of the possesser (she > her : he > his), the gender of the possessive pronoun in French is determined by the grammatical gender of the noun to which it refers. "Ceci est son livre, et cela est le sien" - which would be completely ambiguous. Occasionally, the possessive pronoun can be qualified by a numeral. Voici mon velo, et voila le tien. Here's my bicycle, and there's yours. Il a dû vendre sa voiture et la mienne . He's had to sell his car and mine. Mon père a dû vendre sa voiture, et mon frère a dû vendre les trois siennes. J'ai lu votre document Jacques, et le vôtre, Marie . I've read your document, Jacques, and yours Marie. Il a dû vendre son appartement à lui et son appartement à elle . He's had to sell his flat and hers. In this case French needs to find an alternative solution to the possessive pronoun. La France, c'est moi ! Famous saying attributed to king Louis XIV. Eux ils ont dû partir avant la fin . As for them, they had to leave before the end. Il te l'a donné à toi, pas à eux ! Indirect object pronouns doubled or replaced by emphatic forms. He gave it to you, not to them !. He gave it to you. J'étais assis entre elle et toi . I was sitting between her and you. Nous allons partir avec eux, pas avec lui! We're going to go with them, not with him! Venez avec moi s'il vous plaît . Come with me please . Il and ils are masculine pronouns, elle and elles are feminine pronouns; but the choice is not always as clear cut as it might appear. The choice will depend on the grammatical gender and number of the noun that the pronoun replaces. Usually this is simple: nouns referring to men and males are masculine, so are referred to using il and ils, nouns referring to women and females are feminine, and are therefore referred to using the pronouns elle and elles. However, it is vital to remember that it is the grammatical gender of the noun, and not the natural gender of whatever it designates, that determines the choice between il/s and elle/s. Sometimes this causes confusion. When a plural pronoun refers to a mix of masculine and femine nouns (people), it will always be ils, never elles, even if most of the nouns (people) are feminine. The most common example of a cause for confusion is the noun personne, which is feminine – une personne. Thus, in grammatically correct French, the pronoun that will take up the noun later in a text or statement should always be elle/s, even if the people being referred to are all males. As far as inanimate objects are concerned, in order to know which pronoun to use, it is necessary to know the grammatical gender of the noun. Je respecte cet homme; il est très sage. This lady is very old, she's almost 100. Cette dame est très vielle; elle a presque cent ans. I like these apples, they've got plenty of taste. J'aime ces pommes, elles ont beaucoup de gout . My drill's broken down, it's not working. Ma perceuse est en panne, elle ne marche plus. Ces personnes sont braves, elles ont beaucoup de courage. Look, there are Marie, Françoise, Myriam and Arthur; they're coming towards us. Regardez, il y a Marie, Françoise, Myriam et Arthur, ils viennent vers nous.